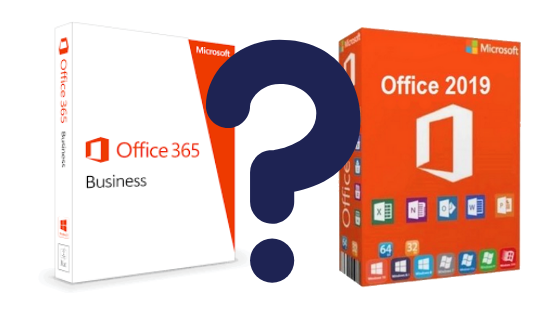 Office 2019 vs. Office 365 - Which One Is Right For Your Business? - SOL-I.S. The release of Office 2019 this past September has left more than a little confusion in its wake. Many individuals and business owners are scratching their heads trying to determine whether Office 2019 offers them something they don’t have access to with Office 365. We want to take some time to address the similarities and differences between the two products and help you determine which one is right for you. Known as a perpetual or on-premises version of Office, Office 2019 requires a one-time purchase. There is no attached monthly subscription fee and once you buy it, it’s yours indefinitely. Available in two versions – Office Home and Student and Office Home and Business – each offer slightly different apps. Home and Student 2019 comes with Word, Excel and PowerPoint while Home and Business 2019 comes with Word, Excel, PowerPoint, Outlook and OneNote. Office 2019 must be installed on a single computer – either a Mac or PC – and while you receive access to security updates you can’t upgrade to a follow-up version. Instead, you must purchase the next version outright for another one-time fee unless at that point you decide to make the switch to subscription-based Office 365. Office 2019 is a good option for businesses with volume licenses who are not ready to switch to cloud-based Office 365. It also appeals to individuals looking for a more traditional Office experience. If you decide that Office 2019 is right for you, you can expect to pay $149.99 for Home and Student 2019 or $249.99 for Home and Business 2019. Are you already operating with Office 365? Then you probably want to stick with it! Not only do you have access to Word, Excel, PowerPoint and Outlook but you also enjoy Publisher, Access and many others and on up to five devices simultaneously. Because Office 365 is a cloud-based product, you unlock regular security updates and improvements and you are always working from the most up-to-date versions of all of your apps. Office 365 also gives you access to 1TB of OneDrive storage as well as Skype. Unlike Office 2019 which can only be installed on a single computer running Windows 10, Office 365 can be installed on devices running Windows 10, Windows 8.1, Windows 7 and macOS. Office 365 is a good choice for individuals and businesses who embrace today’s way of getting work done. In addition to a whole slew of cloud-connectedness advantages, Office 365 offers users the versatility of working from multiple devices – desktop, laptop and handheld. Because Office 365 is a subscription-based product, the cost per year varies depending on which version you choose and the Office 365 Business Premium subscription will make the update to Office 2019 available automatically. The Office 365 Personal plan is $69.99/year while the Office 365 Home plan is $99.99/year. If you would like to know more about Office 2019 or need help determining which Microsoft Office product is right for you or your business, give us a call at 952.279.2424!